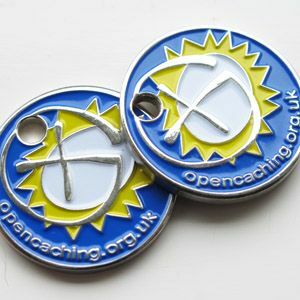 This Pathtag is one of a series produced to mark the creation of an Opencaching website in Great Britain in 2009. If you find one in the wild feel free to keep it. Opencaching sites are non commercial, independent, geocache listing sites. There are also Opencaching sites in Poland, Germany,Sweden, Norway, The Czech Republic, & The USA. This is a refill of an earlier design with a change of metal plating and background colour.